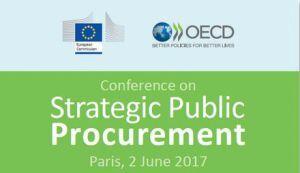 The Conference on Strategic Public Procurement, taking place in Paris the 2 June 2017, organized by the European Commission and the OECD, aims to raise awareness among decision makers and the procurement community about the benefits of strategic procurement with an emphasis on sustainability, social responsibility and innovation. The event will feature speakers recognised for their expertise and leadership in the field and look at policies to support strategic procurement and at key challenges when implementing strategic public procurement. Sessions will also consider the topic of market engagement and the design of award criteria based on innovation/green/social criteria. To attend the conference and for more information on the event, please visit http://ec.europa.eu/growth. The deadline for initial expressions of interest in attending is 9 May 2017.